6th of january is epiphany day – the 12th and last day of christmas. The holiday is over and we can focus on the coming year. 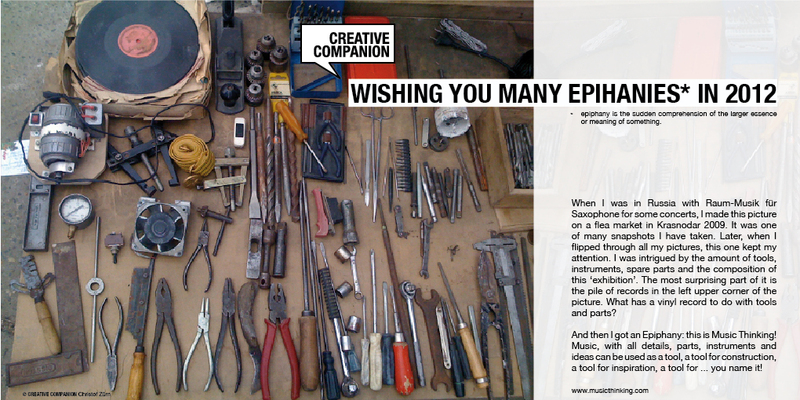 A good moment to wish you all the best for 2012 and hope that you will have many epiphanies! EPIPHANY is the sudden realization or comprehension of the (larger) essence or meaning of something. PHILOSOPHICAL meaning: having found the last piece of the puzzle and suddenly seeing the whole picture. ARCHIMEDES Eureka! I found it! EINSTEIN was struck as a young child by being given a compass, and realizing that some unseen force in space was making it move. DARWIN An example of a flash of holistic understanding in a prepared mind was Charles Darwin’s “hunch” (about natural selection) during The Voyage of the Beagle. JAMES JOYCE Referring to those times in his life when something became manifest, a deep realization, he would then attempt to write this epiphanic realization in a fragment. 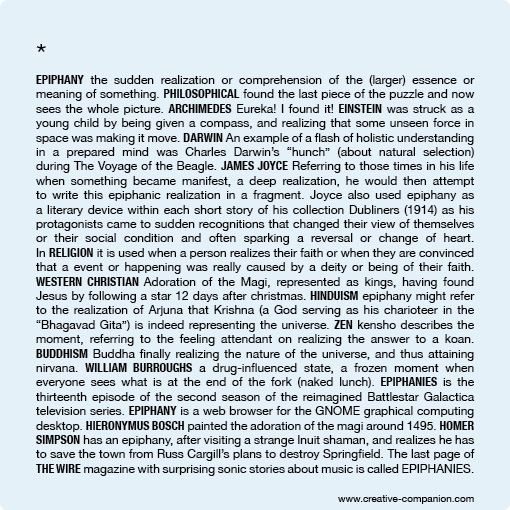 Joyce also used epiphany as a literary device within each short story of his collection Dubliners (1914) as his protagonists came to sudden recognitions that changed their view of themselves or their social condition and often sparking a reversal or change of heart. In RELIGION it is used when a person realizes their faith or when they are convinced that a event or happening was really caused by a deity or being of their faith. WESTERN CHRISTIAN Religion: The adoration of the magi, represented as kings, having found Jesus by following a star 12 days after christmas. HINDUISM epiphany might refer to the realization of Arjuna that Krishna (a God serving as his charioteer in the “Bhagavad Gita”) is indeed representing the universe. In ZEN kensho describes the moment, referring to the feeling attendant on realizing the answer to a koan. BUDDHISM Buddha finally realizing the nature of the universe, and thus attaining nirvana. WILLIAM BURROUGHS is talking about a drug-influenced state, a frozen moment when everyone sees what is at the end of the fork (naked lunch). EPIPHANIES is the thirteenth episode of the second season of the reimagined Battlestar Galactica television series. EPIPHANY is a web browser for the GNOME graphical computing desktop. HIERONYMUS BOSCH painted the adoration of the magi around 1495. HOMER SIMPSON has an epiphany, after visiting a strange Inuit shaman, and realizes he has to save the town from Russ Cargill’s plans to destroy Springfield. The last page of THE WIRE magazine with surprising sonic stories about music is called EPIPHANIES. Interesting: if you search for Epiphanies or Epiphany on TWITTER many people talk about that they (just) had an epiphany, but don’t exactly say what it was. read the article on Wikipedia or just try the Twitter search for realtime results on Epiphany. 6th of january is epiphany day – the 12th and last day of christmas. The holiday is over and we can focus on the coming year. 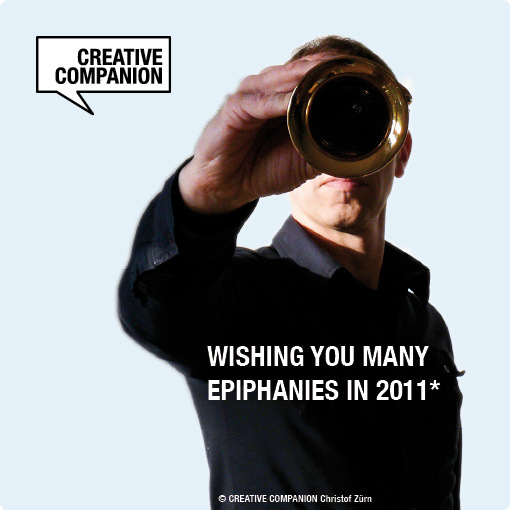 A good moment to wish you all the best for 2011 and hope that you will have many epiphanies!